Normally, concept cars are done for automotive companies. When the company that commissions a concept car is outside of the usual car-making business, that’s when things get nice and bonkers. 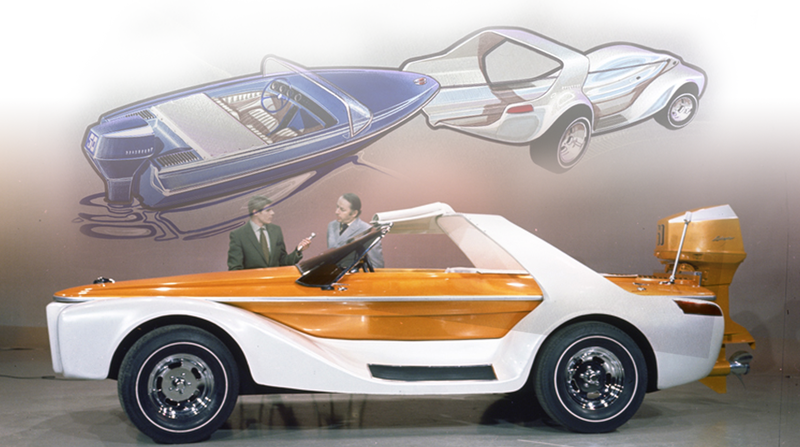 A great example of this is a concept car commissioned by the promoters of the Chicago and San Francisco boat shows, along with Evinrude, the marine outboard engine maker. As you’d guess, the result was half-car/half-boat. But not in the amphibious half-car/half-boat way. This was really more of a boat wearing a car suit. This was the 1970 Evinrude Lakester. The Lakester was a fascinating and novel design from the mind of Brooks Stevens, an accomplished automotive designer who’d worked for Jeep (he designed the Wagoneer! ), Studebaker, Kaiser, and, perhaps most importantly, Stevens was the designer of the legendary Oscar Mayer Wienermobile. He also designed boats for Evinrude, and is one of the designers usually credited with bringing contemporary 1950s automotive design to the boating world. The Lakester is a pretty fascinating, if somewhat half-baked concept car. Fundamentally, it’s a motorboat that can slide into a sort of car exoskeleton, at least according to what the vivid illustrations show. All the driving, on land and water, is handled from inside the motorboat, suggesting there must have been some sort of easily linkable/severable connections from the boat controls to the car’s systems. 1970 would have been astoundingly early for any sort of electrical drive-by-wire system, so I’d expect all linkages would have to be mechanical. There doesn’t seem to be any description of how this would have worked. There’s not a whole lot of technical details about any of it, really. While the concept may have been drivable, I’m doubtful the boat could have actually been removed, as seen in the drawings. The meager technical details that we do have suggest that the Lakester would use “Volkswagen running gear, though this same little blurb from Popular Science also states that “Dune buggy and boat are powered by the same 50-hp outboard motor,” which would be a contradiction and even more mechanically confusing. Also confusing is the mention of a “hydrostatic gearbox of the type used on high-power garden tractors.” A hydrostatic transmission is a sort of continuously variable transmission using fluids instead of belts or gears to transmit power. An interesting idea that may have been selected for packaging efficiency? If the Lakester was planned to use a VW drivetrain, we encounter some interesting issues, specifically, where would that drivetrain be mounted? The standard VW location of the rear wouldn’t work, since the boat needs to slide out the rear, which has to be completely open. It’s possible that an air-cooled VW flat-four engine and transaxle of the era could have been fitted up front, driving the front wheels, as was done in the VW Basistransporter and VW Gol, both of which came after the Lakester. Hey, look at that! The boat actually did slide out! This doesn’t prove that the prototype was in any way drivable, but it wasn’t just a fiberglass body slapped on a VW pan, either. Even if it did drive and work, there’s still a number of issues with the fundamental design: what do you do with the wheeled car-sleeve when you get the boat out of it? If you back it close to the water, how do you then move it out of the way? How hard is it to get the boat back into the car? Some sources mention an electric winch to help with this, so that’s a plus. That motor looks pretty heavy and scrape-y, after all. In that picture above, for example, what are they going to do when they get the boat out? Laboriously drag it over the sand to the water? I guess so? The projected price for the Lakester was $2,500, which, in today’s dollars would come to around $16,000—that would be a hell of a deal for a car/boat combo. Nobody seems to know where the concept Lakester ended up, which is a shame, since it’s strange and fascinating. A good guess would be at the Brooks Stevens Museum in Wisconsin, but, sadly, that museum closed back in 1999. So, everyone, keep your eyes out at lakes for people driving up in strange, sleek-looking dune buggies that somehow birth sleek motorboats which have to get clumsily dragged into and out of the water.